For self publishers the conversion from Word to InDesign is a huge leap. The goal is a professional look to their book designs, but immediately the problems of typography raise their head. In Word that is not so much of an issue because the typography controls in Word are well hidden and quite limited. But now you can do all the things necessary to communicate clearly, effectively,and beautifully with type. How should I set up my type? What fonts will work for me? How many fonts do I need? How do I style my paragraphs? How do I set up my columns, margins, & sidebars? These and many more questions need to be answered before you can layout and format your new book. The included book, Basic Book Typography, answers most of them. It provides an overview to the whole area of typography so you can confidently proceed with the production of your book. David has been a production graphic artist, typographer, art director, and teacher of these things for over 40 years. He provides you with the answers you need. That’s still $189.95 if the four families are bought separately. I would like to learn how to use Adobe InDesign, but I have attempted to take a course online through a local community college, and the course proved to be so frustrating to work with online that I had to drop it. I was wondering whether you could recommend a way to learn InDesign that would not require my taking a difficult online course. In fact, I am taking a kind of course through Lynda.com in InDesign, and this course is easy to work on because the explanations are simple and clear, but there is no interaction and therefore no way that I can do exercises and really learn the program. I am interested in publishing books online, and I would very much like to learn InDesign to do this. Would you have any suggestions about how I might learn the program on my own? The main thing is to practice on real work. Sandee Cohen’s Visual Quickstart is very good as you begin, because it will tell you how every command in the application works. You can use it as a reference. I have a new book called “Practical Professional Self Publishing Handbook” which I hope to release by the middle of May at the latest. 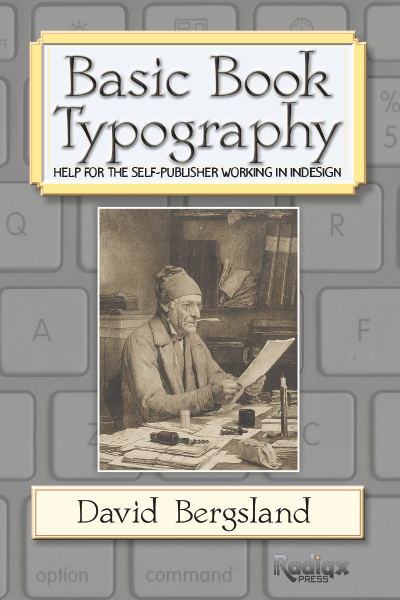 I tells how to use InDesign to produce a book starting at a beginning level. My “Writing In InDesign Revised Version 2.5” does this for InDEsign CS6 but it does not have as much beginning information as the new book does. Start by putting short books together—even if they are only 4-8 pages. Take whatever writings you have and make them into a book. I can answer some questions for you. If you want an ongoing mentorship relationship, I’m willing to talk about that also.